Its name, Cascabel, which translates to rattle, comes from the sound it makes when you shake it. With its sphere, globe-like shape, the dried seeds have a lot of room to play and make noise in. Sometimes, because of that shape it is also called Chile Bola, as in ball. Different from most fresh chiles that are dried, it retains its shape and doesn’t flatten out once it is dry. Also, different from many chiles, it maintains the same name when fresh or dried. It has a thick and smooth skin and a gorgeous deep brown color with red and sometimes copper hues. And its flavor resembles those colors: toasty, nutty and rustic with moderate heat. 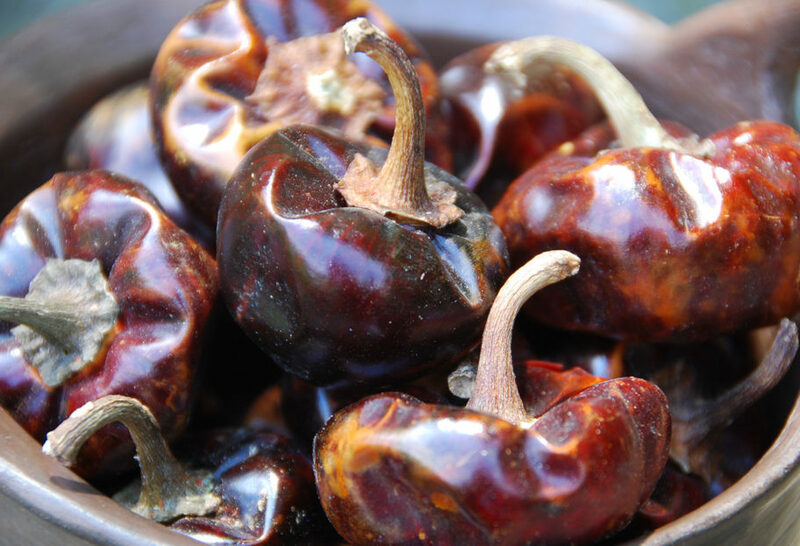 The Cascabel is used in many ways from salsas to stews, to sauces and soups. It is used as is toasted, ground or simmered. It is not widely available outside of Mexico or even in some areas of Mexico. 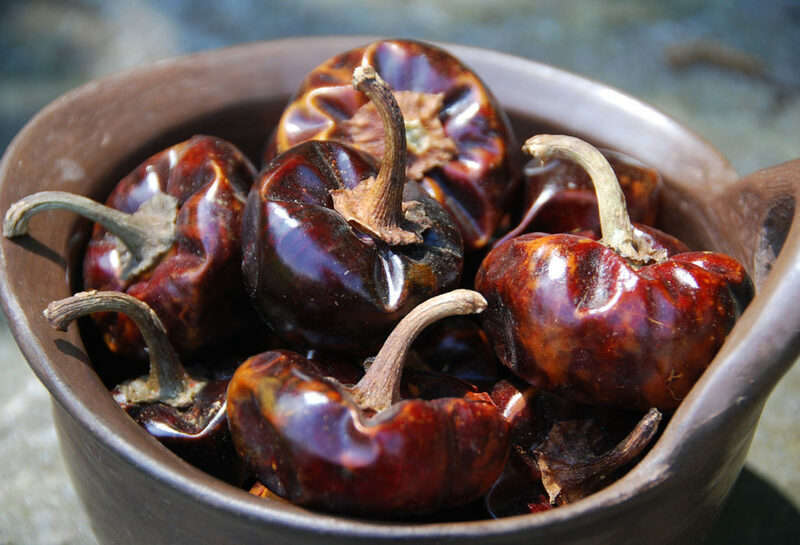 When I get my hands on some, I of course like to cook with the Cascabel Chiles, but I also get a good amount of pleasure admiring them as they sit in a bowl in my kitchen. Are these also called Canica chiles? When I was in the DF I was overwhelmed by the beauty and choices of chiles in the mercado San Juan that I bought so many and brought them home and now am not sure what to do with them! I have a large bag of what the woman called Canica chiles, they look very similar. Do you have any recipes? you can tear them up and chew them on their own! delicious and now available from Waitrose in the UK. I am trying to duplicate a pork taco recipe I remember many years ago (1970’s) while growing up in my primary years. It was for Guisado de Puerco. I have used a combination of dried peppers over the years, and recently have come across the Cascabel Pepper. The Bright red color, is it something that can be achieved with FRESH cascabel – not dried? Any suggestions are very appreciated. I do my adobos or marinades mostly with dried chiles… but you can of course give it a try with fresh. The dried chiles have an extra punch of flavor, from benign dehydrated. It sounds like it, Myrleen! They darken as they dry. I’m a little confused. Is the cascabel chile always used dried or is the fresh chile also eaten? If so, is it eaten cooked? Raw? I just bought a bag of cascabel chiles from Penzeys spices. Beautiful! Now need some recipes to use them. Penzey’s spices are available on line, and they have a number of stores. One is in Rockville, Md. The aroma when you walk in the door is incredible. I travel there from Baltimore several times a year to stock up on spices. I was looking for ways to make the dough for enchiladas potosinas and I stumbled across this chile and your site. Would you happen to know if this chile can be used for that? My mom just bought me a bunch of chile cascabel and I don’t have a recipe to use them with! I had a friend from the D.F. that made salsa for me a long time ago and it was DELICIOUS! Do you have any other recipes to share that I can use this chile besides salsa? P.S. My family (i.e. mom, me and sisters) LOVES your site and show. You have opened up our Sonorense cuisine to the many treasures found in so many other Mexican states. Thank you so much and we look foward to what’s in store. Gracias Raquel! Will try to post some options for Chile Cascabel on the blog soon… Thanks for writing! How do you use Cascabel Chiles, whole for flavour in stews, our do you chop up, or grind for what ever recipe you are preparing. We have never used dryed chiles but would like to try them. Bought bag of dryed when we were in Florida this year. So many ways! You can toast them lightly (or boil them!) and use in a sauce, pureed with cooked tomatoes, tomatillos, onion and or garlic, salt to taste… and start from there!